The winners of seven BC Book Prizes, as well as the recipient of the fifth annual Lieutenant Governor’s Award for Literary Excellence, were feted before an audience of authors, publishers, media and friends. 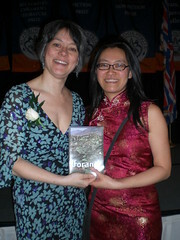 Todd Wong and Leanne Riding, co-presidents of Asian Canadian Writers' Workshop attended the ceremonies. ACWW secretary Ann-Marie Metten is also on the board of the BC Book Prizes. recipient of the 5th annual Lt. Gov. Lifetime Achievement Award. This photo is public. Change? Todd Wong – where's your kilt? Todd poses with kilt wearers Bill Horne, a book layout specialist from Wells BC, and Pipe Major John Mager. “Where's your kilt” asked the Lt.Gov. Stephen Point to me at the BC Book Awards. Sometimes people just don't recognize me if I am not wearing a kilt. Funnily, It had taken Lt. Gov. Stephen Point a moment to recognize me after presenting me with the certificate for the BC Community Achievement Award a few days before on Wednesday in Government House. This entry was posted in Literary Events, Main Page on April 29, 2008 by Todd. two-time Olympic paddler at the Sydney and Athens summer Olympic games. And she is v-e-r-y “Gung Haggis” with both South Asian and Italian ancestry. parallel with the water. That's how far your reach should be she said. Kamini makes Stephen M utilize all his potential r-e-a-c-h! screen, while we enjoy cabohydrate replenishment. to myself and Stephen Mirowski, so we can have a roster count confirmed for each day. 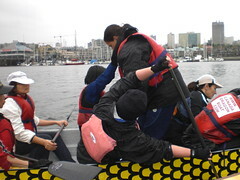 paddler corrections. hint… more personal coaching on Wednesday!!! 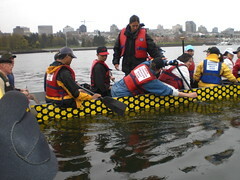 This entry was posted in Dragon Boat photos 2003, Dragon boat with Todd Wong - Dragon Boat Coach, Gung Haggis dragon boat team information, Main Page on April 28, 2008 by Todd. 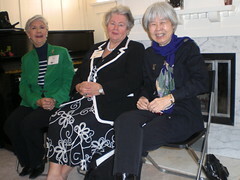 It was a wonderful busy busy day of celebration at Joy Kogawa House on April 25th. 8pm Music and Poetry with Joy Kogawa and Friends, featuring poets George McWhirter, Heidi Greco, Marion Quednau, soprano Heather Pawsey, flautist Kathryn Cernauskas, pianist Rachel Kiyo Iwassa, and composer Leslie Uyeda. 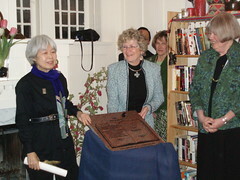 Following the music, Joy was presented with the George Woodcock Lifetime Achievement Award from BC Bookworld Publisher Alan Twigg, Vancouver Public Library Community Programs Director Janice Douglas, and historian Jean Barman. Last night was one of the most beautiful and profound evenings of my musical life. Heartfelt thanks to everyone behind Kogawa House. May it continue to rise and spread its wings. This entry was posted in Joy Kogawa & Kogawa House, Main Page on April 27, 2008 by Todd. Raymond Louie is hosting celebrated author Wayson Choy for a special reading in support of Raymond’s campaign for mayor. Where: Mekong Restaurant, 1414 Commercial Dr. I have known both Wayson Choy and Raymond Louie for a number of years. I find them both very genuine people, dedicated to their communities. I first met Wayson while I was on the inaugural One Book One Vancouver committee. 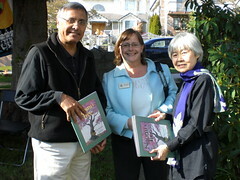 I first met Raymond while his wife was on the Vancouver Asian Heritage Month Society. And we all worked wonderfully together. face because he’s been there. His success is an amazing Canadian story. secure in those pages a just and equal future for all. This entry was posted in Literary Events, Main Page, Upcoming Events on April 27, 2008 by Todd. composed especially for these three artists. to live and work at the house, beginning in March 2009. This entry was posted in Main Page on April 25, 2008 by Todd. 1) Joy and Timothy @ Kogawa House circa 1939 2) Joy and Timothy with friends circ 1939 3) Rev. Tim Nakayama, Roy Miki, Joy Kogawa and Todd Wong May 2005, at the Obasan Launch for One Book One Vancouver, Vancouver Public Library. This is truly a miracle story. I remember in the early 1980's shelving “Obasan” on book shelves while I worked at the Vancouver Public Library. Just the existence of the book spoke to me about Asian-Canadian history and identity. I was inspired to learn more about Japanese-Canadian history as part of my own Asian-Canadian history, as part of my own identity as a Canadian. s copy of the poem. Many years later, I am honoured to call these great Canadians as friends. It is a pleasure to be president of the Historic Joy Kogawa House Society, with so many good-hearted people on our board. As I told CBC arts reporter Paul Grant, back in 2005 when we had just re-started the Save Kogawa House campaign, “Saving the house is a calling. It's something that has to be done. Today, we have a literary and historic landmark for not only the City of Vancouver, but for all Canadians. And we still have work to do. We must restore the house to its 1942 qualities when Joy and her brother Tim lived in the house, before they were sent away to the internment camps and beet farms. We must build a writer's-in-residence program for this house. She begged the owners for a chance to get the house back. They never replied. More than 60 years later, in a charming circle of history, Ms.
springtime blossoms, as much a miracle of survival as the house itself. award-winning novel Obasan, about the tragedy of internment. face of things that are terrible. undiminished energy and flashing eyes. all a bit surreal, dream-like. I don't know even how to describe it. She headed into the basement. Suddenly, there were gasps of surprise. wall. “And there's some of the cedar planks that my father put in. move,” she said, without bitterness. “The story of this house has come to a wonderful place, like a new beginning,” she said, groping to find just the right words. This entry was posted in Joy Kogawa & Kogawa House, Main Page on April 25, 2008 by Todd. Victoria and BC has deep Scottish and Chinese roots. At the BC Royal Museum, I found nearby pictures of both Scottish and Chinese pioneers. Okay the Scots were in the front, and the Chinese were in the back, and they seemed to be separated by more than the metaphorical space between them. I spent 8 hours in Victoria and about 9 hours travelling there and back to the BC Community Achievement Awards on Wednesday April 23rd. We almost missed the 9am ferry due to the stupid delays trying to go against traffic through the Massey tunnel. We arrived at the Tsawwassen ferry terminal 12 minutes after the 8:30am deadline for 9am reservations. “But I have to be at Government House to meet the Premier and the Lt. Gov. to accept an award,” I pleaded. It was 8:50 and cars rushed down beside us in lane 29. Finally at 8:55 our lane started moving. We got closer to the ferry. Then we stopped. Then we started again. We kept following the car in front, as we drove past the lead car in row 29. We were now heading towards the ferry….yippee! A few cars behind us made it on. Relief. On the ferry, we got in line to have breakfast. My dad waited while I checked the Pacific Buffet for my friend and award nominator David Kogawa. I came back to the line up, and told my girlfriend, I should go check around for David. At that moment a dapper looking elderly Asian man with white hair appeared. It was David on cue. “Todd!” a voice called me, as I was carrying my breakfast to the table to join my parents. It was Terry Hunter with his son Montana. Terry was an award recipient along with his creative and marriage partner Savannah Walling, creators of Vancouver Moving Theatre and producers of the Heart of the City Festival on Vancouver's Downtown Eastside. We had a short chat, and we promised to find each other after breakfast. I spotted another award recipient having breakfast. It was George Puil, former Vancouver city councilor. I went to congratulate him. I hadn't known or met George before. He was very interested in hearing about the Historic Joy Kogawa House, and asked many questions about how we were able to save the house from demolition, where the house was, and our plans to restore the house and create a literary centre, and establish the heritage designation. “My old high school teacher,” remarked Mel Lehan, when I told him I had bumped into George Puil. Mel was on his way to Victoria to help his daughter move. It's that time of year, after final examinations, and his daughter had been attending University of Victoria. Soon, I was talking with Terry Hunter and his son Montana. David Kogawa joined us. And soon we were talking about the Japanese Canadian community and it's historical role on the Downtown Eastside. I told Terry that we were going to the BC Royal Museum to meet author Gary Geddes. David really wanted to go too, since there is a picture of his friend Joy Kogawa featured in the exhibit “The Party.” Terry offered to give David a ride into Victoria, since they were going in that direction past the museum. It didn't take long to drive down the Saanich Peninsula into Victoria. This was the first time my parents had been to Victoria in about 5 years. My dad had been born in Victoria, and his father had managed the largest Chinese general goods store up to the 1920's in Victoria Chinatown. I can remember many visits to Victoria as a child with my parents. One visit in the 1960's was to the first agricultural hot houses on Vancouver Island which my mom's cousin's family, the Lum's owned. 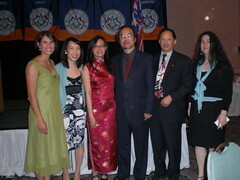 My Aunty Roberta's brother-in-law Ed Lum had been the first Chinese-Canadian mayor of Saanich many years ago. Our visit to the BC Royal Museum was a very exciting one. Last year, the BC Royal Museum had contacted author Joy Kogawa because they wanted to include a full length picture of her for an exhibit celebrating 150 years of BC history. But Joy didn't like the picture that the museum had selected, and the pictures Joy did like weren't completely full length. I offered that my girlfriend Deb and I would do a photo session for Joy. The pictures turned out wonderfully and the museum was happy when we sent them 6 pictures to choose from. Then the museum called Deb and asked for pictures of Gung Haggis Fat Choy. One of the 150 Years exhibits had the theme of food, and they found a picture they wanted on my website www.gunghaggisfatchoy.com. Deb put them in contact with our photographers who had taken pictures, and a picture by Ray Shum of the 2007 Gung Haggis Fat Choy dinner was selected. At the museum, we were soon met by my friend, author Gary Geddes and his wife Anne. Gary had already seen the exhibit and said it was quite good. We got our guest passes and followed him up. 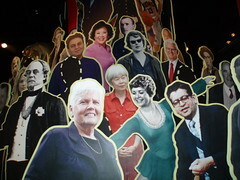 As we entered the exhibit room, we quickly saw all the life size photos arranged like a celebratory birthday cake. 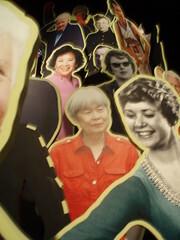 It is a riot of images of famous British Columbians in many different poses. Some black and white, some colour. Quickly catching my eye was the photo of Bryan Adams, and then an almost naked Dr. David Suzuki. Rick Hansen in his wheelchair. 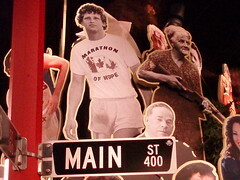 Terry Fox up high, wearing his “Marathon of Hope” t-shirt. But where was Joy? We followed Gary around to the other side, my eyes constantly stopping on every image I saw – wanting to identify each figure, but at the same time keep moving to find Joy. It's a nice photo of Joy, and the photo credit is attributed to Todd Wong. Cool! There are also black cut-outs with segmented lines, representing missing people yet to be chosen. If you think the exhibit is missing somebody that should be included, you can nominate them. If you think somebody chosen, shouldn't be there – you can vote them out too! If you think Toddish McWong and Gung Haggis Fat Choy should be part of “The Party” to represent multiculturalism in homage to BC's pioneer Scots and Chinese – you can click here! Wouldn't this be a great image to include in “The Party?”, rubbing shoulders with “Mr. Peanut” and “Expo Ernie” as well as DOA, The Raging Grannies, Nicholas Campbell, Pam Anderson and David Suzuki? Chinese Canadian history is not all about gold seekers, railway workers or the head tax. 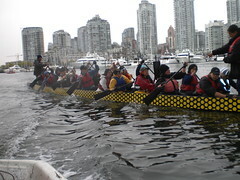 It is also about adventure, endeavor and suffering – all universal experiences of every immigrant group to Canada. Canadian Culture Online and the Ontario Trillium Foundation. 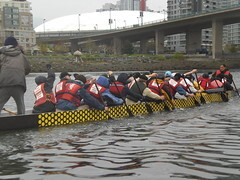 This entry was posted in Asian Canadian Cultural Events, Chinese Canadian History, Main Page, Multicultural events, Vancouver Heritage and History on April 25, 2008 by Todd. stage, how to address the Premier and the Lt. Gov. Then Lt. Gov. Honour, Premier,” and state our name and where we were from. Next we were to be piped in to the ball room by the Lt. Gov. personal bagpiper, Pipe Major John Major. As soon as the bagpipe music started, somebody pointed at me and my kilt. I smiled and feigned covering my ears. Back at the end of the line in the hallway, I could hear the sound of the audience clapping to the beat of the music. Walking into the Government House ballroom was special. An audience of 200 were clapping and full of smiles. There were TV cameras filming us as we walked in. My mother was standing beside them with her new point and shoot digital camera. My girlfriend Deb waved enthusiastically to me, as I walked up the centre aisle to find my seat. BC Achievement Foundation and Gordon Campbell, Premier of BC. 45 recipients were each named, and a very nice bio for each person highlighting their achievements was read by Keith Mitchell. I listened to 44 remarkable bios, amazing in scope, but similar in dedication and commitment. From creating programs for seniors, or suicide prevention to civic duty, fundraising, artistic creations and leadership. You cannot help but be humbled by the achievements of these award recipients. Then… my name was called. I was last on the list. And a bio was read about me. It seemed amazing that they could find so many positive things to say about me, and I could only nod in acknowledgment. I smiled at the audience, knowing everybody was watching me, as I had watched others on stage. And it is humbling to simply accept the process, and not try to deflect any of the praise, but simply accept and to acknowledge that you are this person they are speaking about. These are your achievements. The speaker began be describing my contributions for promoting Asian-Canadian arts and literature. Next he described Gung Haggis Fat Choy, and people laughed in good humour. And when they described the campaign to save historic Joy Kogawa House, heads nodded and faces smiled. Official picture: Lt. Gov. Stephen L. Point, Todd Wong, Premier Gordon Campbell. have to inspire others to be creative, build bridges and span cultures. Then I shook hands with Lt. Gov. 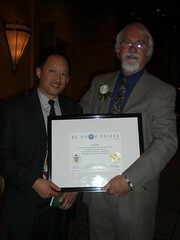 Stephen Point, he said “Congratulations,” and handed me a certificate. I stood between these two men, and we looked at the official photographer in front of the stage. My girlfriend Deb was right beside taking a few photographs, beaming proudly. My parents stood beside my friend David Kogawa who had nominated me for the award. And new friends author Gary Geddes and his wife Anne joined them. The ceremony concluded with a speech by Lt. Gov. 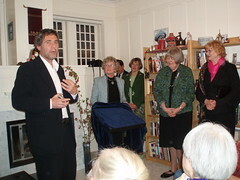 Point, in which he praised the achievements of the collective recipients. So many people came up to me afterwards saying they had heard me on radio, or seen me on television, or had always wanted to come. 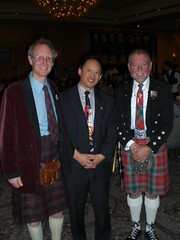 I may have even talked the Mayor of Kamloops into organizing a Kamloops Gung Haggis Fat Choy dinner now. I know that I am one of the lucky ones that receives the media attention for my events and community service, but every single person's story was heart touching, and truly an example of the unsung heroics of community service. There were no rock stars, jazz divas, industry magnates or basketball stars attending like at the Order of BC awards. Everybody there was simply a hard working citizen, committed to their community. And it is so nice that they can each be recognized. It's a wonderful feeling to know that your creations and contributions in the world have reached so many people in a positive way, directly or in many of these cases… indirectly. And to think I almost died from cancer back in 1989. I would have missed this party! Pictures to follow as soon as Deb loads them up…. stay tuned! Walling on my right,Terry Hunter is immediately behind Savannah. Also on my left is fellow kilt wearer Gordon Barrett in his Irish Pipes and Drums uniform – too bad you can't see our kilts. This entry was posted in Main Page on April 24, 2008 by Todd.